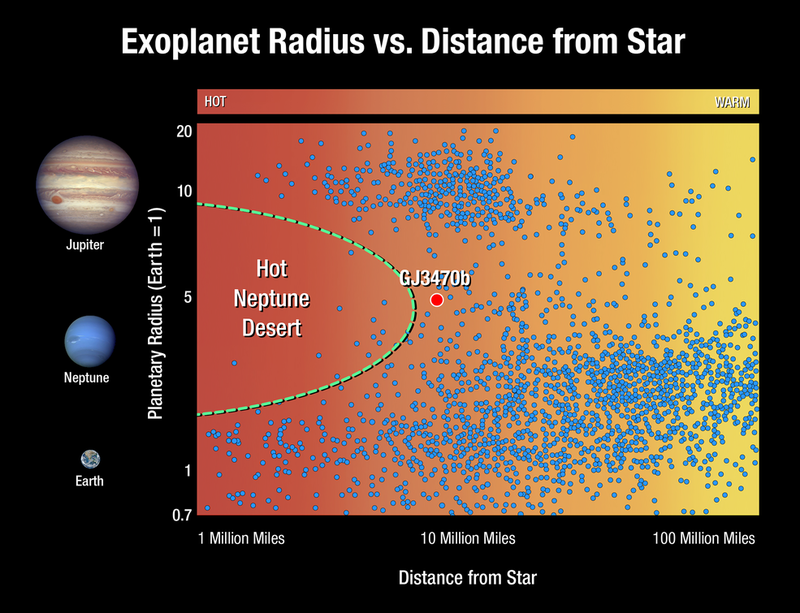 This NASA article talks about how there's a dearth of hot neptune exoplanets that have been discovered so far. The article makes no attempt at postulating why this gap may exist. One possible explanation I have is that the silicate material of a terrestrial planet is difficult to vapourise and the surface gravity of a hot jupiter is too great to drive off hydrogen to any great extent, whereas a Hot Neptune lacks both the solid surface and the gravity to maintain its size. An explanation could be provided by irradiation and evaporation of planetary envelopes. The introduction in the article by Bourrier et al. 2018, which is the source of the NASA press release, explains that as exoplanets migrate inwards, they are increasingly challenged to hang on to their envelopes due to irradiation and heating (insolation) by their star. The Neptune-sized planets are less capable of retaining their envelopes because of lower densities and lower "surface" gravities. The idea is that many of them get stripped of their outer envelopes and end up as "Cthonian" planets that are of "super-Earth" size. A hypothesis is that many hot Jupiters have enough mass and density to maintain a large size for billions of years and hence it is only the hot Neptunes that are depleted. The recent work on GJ 3470b (cited in the NASA press release) supports this hypothesis by finding a very large atmospheric loss rate from a Neptune-sized object at the edge of the "hot Neptune desert". Not the answer you're looking for? Browse other questions tagged exoplanet hot-jupiter or ask your own question. Could evaporating hot Jupiters have metallic hydrogen on their surfaces? Are there any hot jupiters orbiting red dwarfs? If a hot Jupiter collides with the parent star, does it enhance or reduce the life of the star? Hot and “warm” Jupiters expelling terrestrial planets?